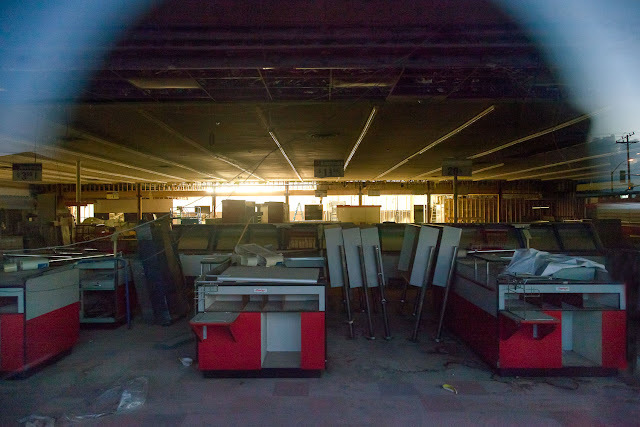 This photo was taken today showing the progress, or lack of progress, at the Hong Kong Supermarket on Duarte Road in Monrovia. I last posted an update on the store back on June 3rd (see it here) and there isn't a lot of visible change in the last 4 1/2 months. There was even a story in the Pasadena Star-News at the time expecting the store to be open by August or September. Didn't make it. Not even close. Interesting. Any idea what the hold-up is? I am also wondering what is the hold up. I don't have any idea. I've seen people working in there, but it is slow going.